What ‘really’ happened to farmville? Whatever happened to Farmville???? don’t see anyone posting about their "good ol’ farm" any more…. and suddenly, i came up with a ‘story’. the plague man… didn’t you hear about it? it was just a fine morning like any other fine morning when the first chickens showed some signs. Instead of pecking onto their grains, they started to peck onto pigs. the pigs started to mate with the cows and a new breed of mutant pigbulls was born. this mutant breed ravaged the farms with such ferocity that within days, farms started to turn barren, all their commodities destroyed by these pigbulls who were continuously growing stronger. 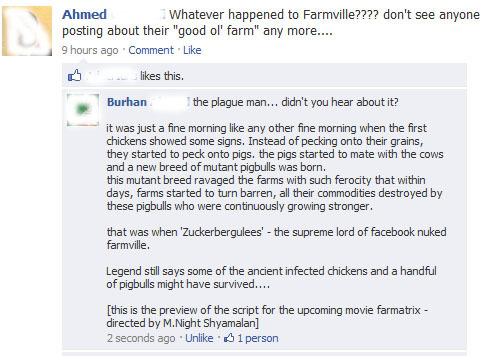 that was when ‘Zuckerbergulees’ – the supreme lord of facebook nuked farmville. Legend says some of the ancient infected chickens and a handful of pigbulls might have survived….